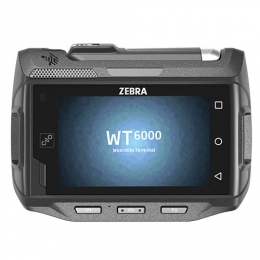 The Zebra WT6000 is a handy Android data capture device which you comfortably attach to your wrist or hip. This keeps both your hands free for full functionality. The 3.2 multi-touch display makes handling easier and is also operable with gloves, or when the display is damp. The three freely programmable function keys additionally simplify complex applications. For full functionality all-touch TE transforms traditional green screen applications into user-friendly touch applications. Together with the corresponding finger scanner and, as needed, headsets, you easily implement a hands-free hardware solution for picking and inventory applications in warehouses. Integrated NFC guarantees quick pairing at the push of a button. Bluetooth and 802.11n/ac WLAN ensure for real-time data transfer. The housing of the WT6000 is IP54-protected against water and dust, and is robust enough for demanding usage in warehouses, distribution centers and industrial environments. With the integrated 3350 mAh battery the WT6000 remains available longer to workers without having to change the battery. Zebra has also built the same battery into the finger scanner RS6000, which greatly simplifies battery management.